World War II is aptly named. Skirmishes and battles occurred literally all over the globe. At a time when most people didn’t leave their town, men and women went to countries they had never heard of. Today we’ll be visiting Libya – a country in North Africa that is bordered by the Mediterranean Sea to the north, Algeria to the west, Egypt to the East and Chad and Niger to the south. It is the fourth largest country in Africa (about the size of Alaska) and has been populated by Berbers since approximately 3,000 BC. Much of the country is dry in nature. 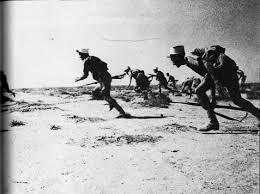 Between May 26 and June 21, a battle took place at Bir Hakeim, an oasis in the Libyan desert. The 1st Free French Brigade defended the area against the German and Italian forces commanded by General Rommel. It was a difficult battle, and both sides used it as propaganda. Churchill renamed the Free French as the Fighting French, and Hitler called the French the second best fighters after the Germans. The fortress at Bir Hakeim (Old Man’s Well) had been built by the Ottomans and later used as a station by the Italians to control movement at the crossroads of two Bedouin paths. The wells had long gone dry and it had been abandoned. The French ultimately lost the battle, but the delay influenced the cancellation of the planned German invasion of Malta. 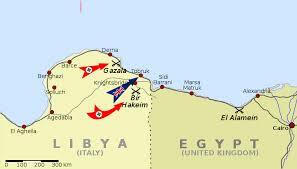 It also gave the retreating British time to reorganize and stop the German advance at the First of El Alamein. 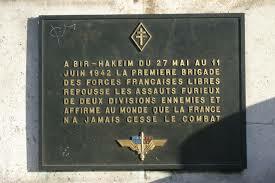 The Paris metro station named Bir-Hakeim, and the bridge Pont de Bir-Hakeim are both named for the battle.